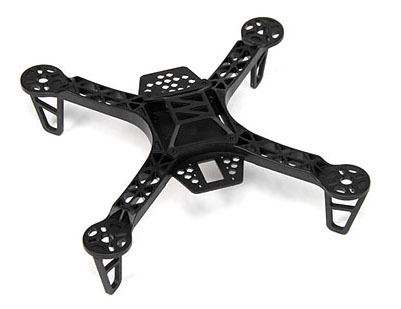 This mini-sized quadcopter is built from high quality and ultra durable polyamide nylon and measures in at a mere 250mm with great FPV capability. 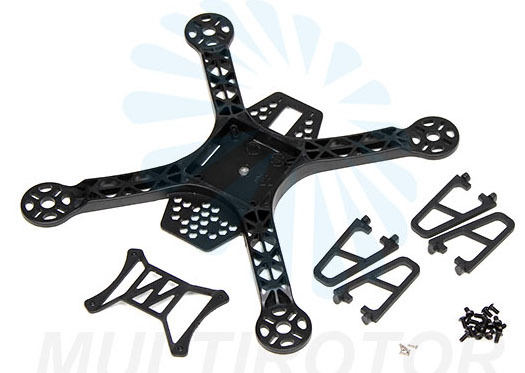 This inexpensive FPV quadcopter frame is perfect for FPV racing or obstacle course flying at your local field. The one-piece nylon frame is extremely durable, giving you the confidence to rock the FPV race season and yet only weights 110g. The front platform is designed to handle up to a 2 servo pan and tilt camera setup and the rear platform supports the video transmitter, to keep it all nice and balanced. The FPV 250 features a center bay large enough for most popular flight controllers and includes a top crash cage for protection. There are four integrated strap slots on the bottom to securely hold the battery in place for high G maneuvering. The FPV 250 motor mounts can handle anything from a 1506 to 2208 motor and the vented arms provide plenty of cooling for your 7-12A ESCs. Built from high quality and ultra durable polyamide nylon. Mounting support for a 2 servo pan and tilt camera and video transmitter. 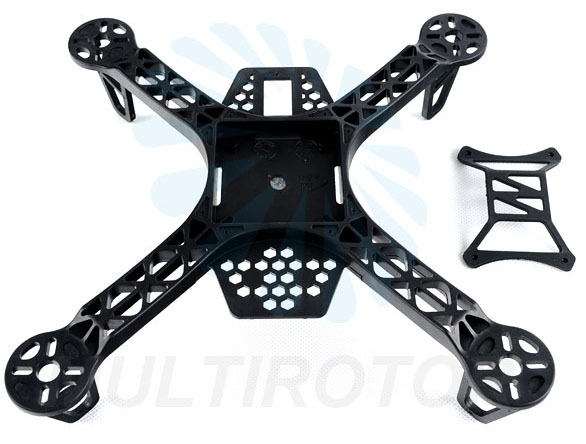 Large 55×55mm cage bay to protect flight controller.